The supply of minerals such as gallium and indium are running short, halting our progress in technology. The Fourth Industrial Revolution risks running out of steam because of a shortage of the essential elements needed to run it. We are used to stories about the scarcity of metals that are needed to power the technology of the future, such as lithium, but there are other, rarer, elements without which mobile phones, DVD players, TVs, microwave communications and driverless cars may all grind to a halt. Ensuring there are sufficient quantities of them could be essential if the high-tech future that governments and global companies keep promising is to happen. 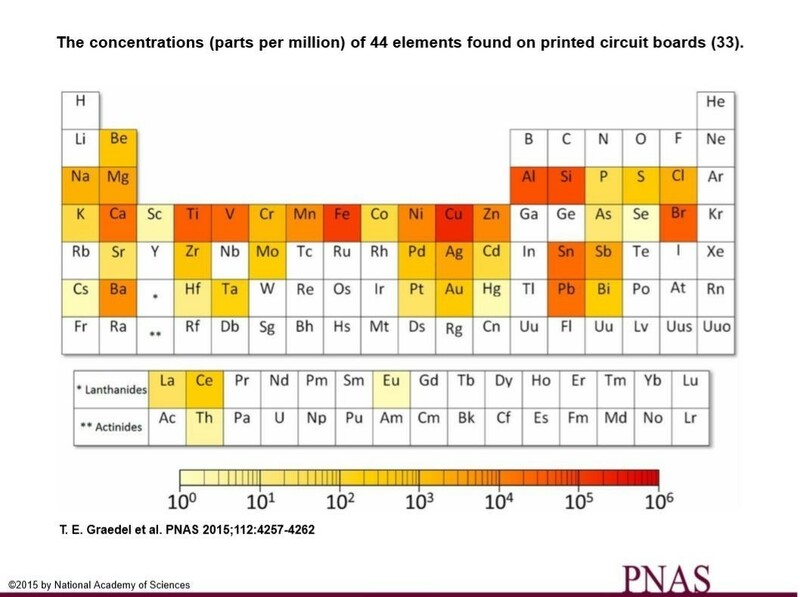 A periodic table, produced for a report by the American Chemical Society (ACS) in 2015, ranked 62 different elements based on their supply risk, environmental implications and vulnerability to shortages. The names of some of the metals in the research may leave non-specialists scratching their heads. They include gallium, indium, hafnium and selenium, all of which are created as the byproducts of other mining and extraction processes. Although their names may be unfamiliar to many, their uses are not. Gallium, a byproduct of zinc and bauxite ores, is used in semiconductors – which provide 98% of commercial demand for the element – as well lasers in Blu-Ray players. Indium, also found in zinc, is used in solar cells, LCD screens, computer chips, LEDs and solar panels. Hafnium, a byproduct of zirconium, is found in nuclear reactor control rods, integrated microprocessor circuits and the liquid thruster nozzles of Apollo lunar spacecraft. Selenium, an extract from ores such as copper, nickel and lead, is used in photocopiers, x-ray detecting machines and developing battery technologies. But answers as to how we may cope without them were outlined almost a decade ago by a famous creator of wondrous, if occasionally dystopian, futures. Silverberg then outlined what states and companies needed to do to guarantee the high-tech future they envisage: “Solutions will be needed, if we want to go on having things like television screens and solar panels and computer chips. Synthesizing the necessary elements, or finding workable substitutes for them, is one obvious idea. Although the prediction that certain metals would disappear by 2017 was wrong – and the authors of the 2015 periodic table and research did not give any of them expiry dates – the truth is that depending on any of these elements could create problems in the delivery of Industry 4.0. Two of the wider risks ACS highlighted are well known: one is the environmental hazards caused by the mining and extraction processes of metals, such as use of toxic mercury by artisanal miners to bind lumps of gold together. As well as being harmful to natural ecosystems, mining also depends on fossil fuels that create carbon dioxide and other emissions that contribute to climate change and damage human health. The other is how to maintain levels of vanishingly rare metals, such as gallium, that are only produced as byproducts of smelting and other industrial processes. But a third is underreported, and it is this: even metals that boast high natural reserves, such as gold and platinum, as well as being among the most environmentally damaging to extract, are “geopolitically highly concentrated”. Their very abundance in places such as China and Africa – and scarcity elsewhere – could pose future problems. As the ACS authors noted: “[In 1962] a civil war in the Democratic Republic of the Congo caused a significant, if temporary, decrease in the supply of cobalt... More recently, a decrease in exports of rare earth elements by China resulted in a variety of technological disruptions. “The result has been numerous calls in recent years to better assess elemental resources and to determine which of them are ‘critical’, the aim being to minimize further disruptions to global and national technologies and economies”.